This section gives links to the various resources available to the Chaos Dwarf players, to assist them in playing the game. Chaos Dwarf FaQ/errata to Legion of Azgorh by Forge World. 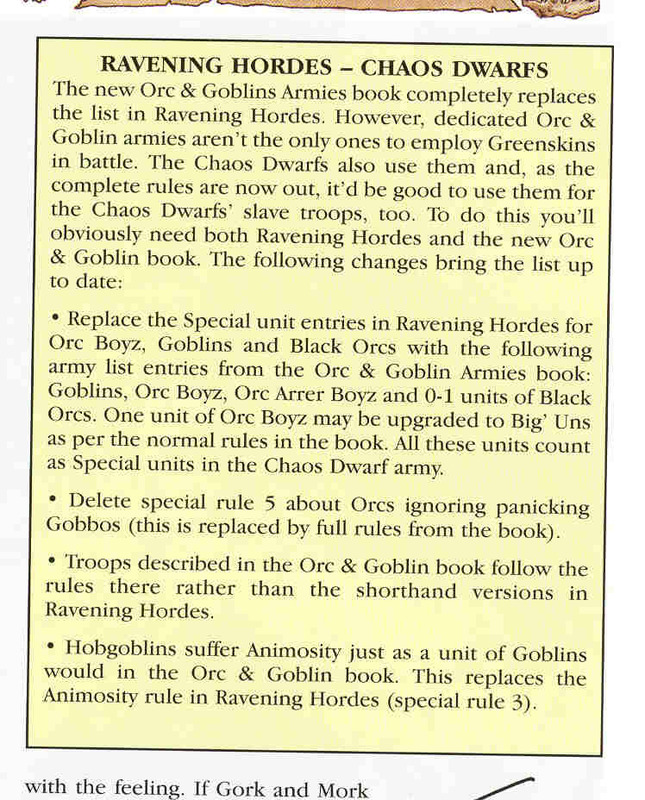 Chaos Dwarf Fan Rules, army books made by chaos dwarf enthusiasts. Chaos Dwarf Army Building Spreadsheet (zipped xls) - Spreadsheet for making army rosters quickly and easily. The Ravening Hordes army list is remains official and current in 8th edition and it note replaced by the Legion of Azgorh list. The first print of Ravening Hordes had some minor errors (such as the Bolt Thrower having three crew) that were corrected in subsequent prints and the PDF. Games Workshop no longer hosts the Chaos Dwarf rules and does not allow CDO to host them. Warriors of Chaos FAQ with rulings on the Hellcannon. Kelly, Phil. Ogre Kingdoms. (Games Workshop Ltd., 2005) 14.